The Archery Team was formed in the 2014-15 school year and has had an active season this year. They participate in the high school AAAA division in a program called Archery in Mississippi Schools (AIMS). Bill Bunch and Mallory Gnemi coach the team. 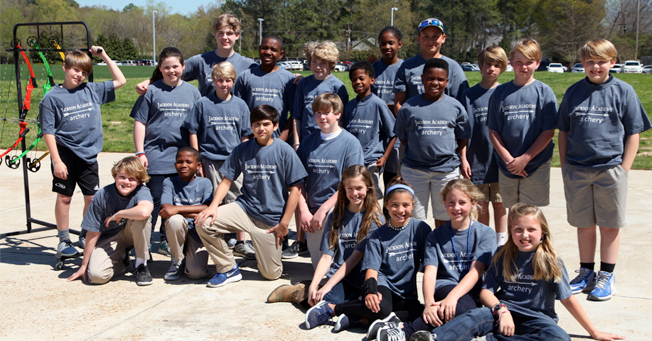 Students have participated in five tournaments–two hosted at JA against Christ Covenant and Hartfield Academy, one at Germantown Middle, one in Coffeeville (North State Tournament), and one in Jackson (State Tournament). Archery team members include Karla Brown, Zach Brown, Owen Carter, Gunner Cress, Hudson Hadley, Samuel Hadley, Ann Cole Hammons, Marcus Harris, Nicholas Harris, Michael Hederman, Caleb Hernandez, Harrison Johnston, Katherine Kelly, Gracie Drew Pratt, Olivia Quin, Jude Reeves, Kendall Ross, Logan Thomas, Laila Wilkens, Skylar Wilkins, Fran Wilkirson, and Annalee Willson. A team score in archery, a co-ed sport, is the sum of scores of the top 12 archers with at least four of the 12 top scores to be from a different gender, whether boys or girls. The team score at the AIMS (North State Qualifier March 21-23) was 2,584. At North State, seventh grader Caleb Hernandez was ranked at No. 42 out of the top 100 male scores and No. 48 out of all scores. That is 48 out of 1,425 scores. The team score from the AIMS State Tournament last week was 2,603. Archery is considered the fastest growing sport nationally and in Mississippi according to the Mississippi Department of Wildlife, Fisheries, and Parks website. The site notes that the program, which began in 2005 with 10 schools, is now in almost 500 schools and in 50 counties with more than 70,000 students participating each year. The first statewide Archery Invitational was held in Mississippi in 2011 with 400 student archers competing; and that number has expanded to over 3,900 student archers competing annually in the AIMS State Championships. Mississippi students also rank at the highest levels in both national and international archery competitions every year.